Casein is a form of protein that can be very effective for muscle building. We'll go over what casein protein powder is and how you should use it; and also offer a few highly recommended brands. Everyone needs protein. It’s a fact. However, eating a half dozen chicken breasts or egg whites each day may seem a bit too much. Have no fear, there’s another protein source that delivers the same great results. Casein protein powder is a popular choice amongst athletes and bodybuilders looking for long-term health and performance benefits. Unlike whey, which is great for providing a pre- and post-workout protein boost, casein takes more time to digest and lasts longer, allowing you to experience the advantages of premium protein day and night. What is Casein Protein Powder and Why Should You Use It? Casein is the primary protein found in milk. While many plant proteins are incomplete and lack amino acids, casein protein provides BCAAs in ample amounts. When taken before bed, this slow, prolonged release of amino acids will minimize nightly muscle loss. It will also keep you satiated for longer when consumed in between meals. Want to build colossal muscles quickly? You guessed right, casein will help you with that as well. In fact, a Texas study found that casein also yields an increase in lean muscle mass. (2) That’s right; simply drink a casein protein powder shake in the afternoon and again before bed to almost effortlessly improve your physique. If that weren’t enough to jump on the casein bandwagon, it’s also been proven to boost your metabolic rate. According to a study published in the Netherlands, participants who increased their typical casein intake by 25 percent had higher metabolic rates throughout the night when sleeping. (3) Plus, they experienced fat loss and increased lean muscle mass as well. Last but not least, casein also improves overall strength. Whether you’re a stacked gym rat or an overworked office assistant who can only find time to work out once or twice a week, chances are you wouldn’t mind a little more strength. The best casein protein powder provides exactly that. In a Massachusetts study, casein proved to actually double the muscle-building effect of whey protein alone, especially in the chest, shoulders, and legs. (4) This is thought to be due in large part to casein’s powerful anti-catabolic abilities. With all these benefits, it’s clear. The next time you feel like a midnight snack, reach for the casein protein powder and make up a shake! Answer this question: When does your body go without protein, vitamins, minerals, and other essential nutrients provided from food for the longest amount of time? If you answered “at night,” you happen to be right. We should all sleep 7-8 hours each night, but during this time, we’re basically fasting the entire time. However, if you’re looking to maximize your metabolic rate and muscle mass, you can’t go that long without protein. This is where casein can help. Thanks to its slow amino acid release, your body can still receive the proteins it needs while you’re sleeping and avoid going into a catabolic state. By sticking to this schedule, you’re guaranteed to get the most from what both of these fat burning, muscle building proteins have to offer. When shopping for the best casein protein powder, or any protein powder for that matter, it’s important to understand not all are created equally. While some feature nothing but pure protein, others feature carbs and fats as well. These are known as mass gainers, and should be avoided unless you’re hitting the weights hard and looking to bulk up. • Low in carbs – Under five grams of carbs per serving is okay, but less is better. • Low in fat – One to three grams of fat or less per serving is ideal. • High in protein – High-quality casein protein should offer at least 20 grams of protein per serving. That being said, the quality of a casein protein powder is far more important than its protein quantity. When choosing a casein powder, read the label and make sure it only contains a handful of natural ingredients. The keyword here is natural. If a casein powder has ingredients you can barely pronounce, it may be a sign to move on to a less adulterated option. US FARMS ONLY: Naked Casein is brought to you only from US farms to ensure that our unflavored casein protein powder is packed full of essential amino acids, clean protein and BCAAs. COLD PROCESSED: Naked Casein is cold processed, which means there is no contamination from chemical detergents (no acid or bleach), synthetic additives, or heavy metals. 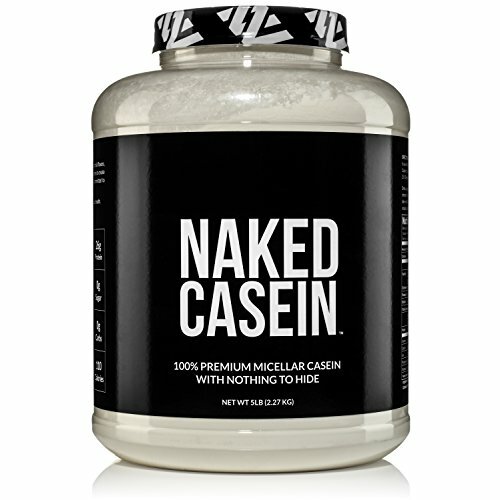 NAKED Casein only utilizes one ingredient: Casein Protein. Unlike many other additive-packed casein protein powders, NAKED Casein features only 100 percent micellar casein protein and nothing else. Not only is it cold processed to ensure zero contamination, but NAKED Casein only uses protein harvested from US Farms as well. This ensures each batch of clean protein is loaded with essential branched-chain amino acids for maximum weight loss and lean muscle growth. With 26 grams of premium protein and 5.9 grams of BCAAs per serving, NAKED Casein certainly packs a protein punch. Although it’s a bit pricier than other casein protein powders, it’s by far one of the best. If you’re searching for nothing but clean, unadulterated casein protein to add to your daily routine, NAKED Casein won’t disappoint. 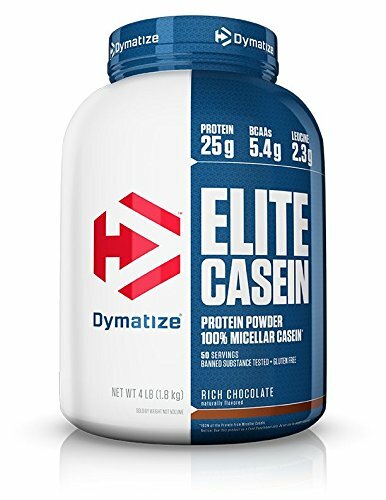 Dymatize Elite 100% Micellar Casein Protein features a cutting-edge casein formula for maximum protein and amino acid absorption. Put to the test at elite training facilities and in a number of university studies, Dymatize Micellar Casein Protein is some of the best in the business. Each serving of Dymatize provides 25 grams of 100 percent micellar casein and five grams of BCAAs. Unlike NAKED Casein, 2.3 grams of Leucine are also added per serving for an extra amino boost. Like any quality protein powder should, Dymatize is rigorously tested and certified clean and safe. You receive nothing but pure, intact proteins with no amino spikes. Dymatize Casein Protein is also gluten-free and available in four tasty flavors. Although casein protein powders are notorious for not mixing as well as whey, Dymatize actually dissolves and mixes better than most, providing a nice smooth texture suitable for a shake, not just oatmeal. 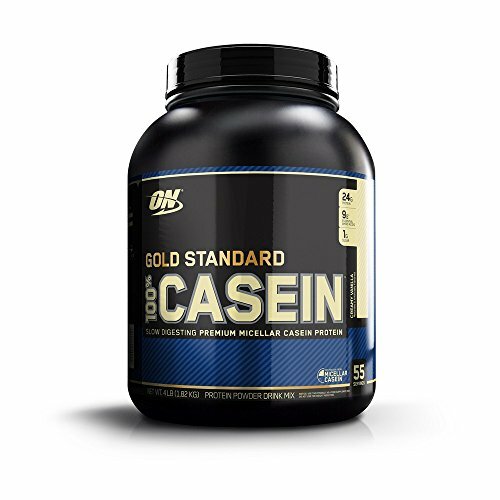 Optimum Nutrition Gold Standard 100% Casein Protein Powder is a longtime favorite and widely considered the benchmark for high-quality casein protein. Unlike other fly by night protein powder manufacturers, Optimum Nutrition has been providing premium protein solutions for fitness buffs for over 30 years, and its experience definitely shows. The brand’s casein protein powder delivers 24 grams of pure micellar protein and nearly five grams of BCAAs per serving, providing you with the slow-release protein and amino acids you need to stay at the top of your game. Optimum Nutrition Gold Standard Casein Protein Powder is also available in plenty of flavor options and tastes much better than other casein proteins when mixed with milk, making it great for tasty after dinner shakes. Whether you’re trying to sculpt the perfect physique or increase your strength, fitness, and athletic performance, you need casein protein. However, no run of the mill casein protein powder will do. You need NAKED Casein. As you can see from the list above, there’s a bevy of premium casein protein powders out there to choose from, but none match up to NAKED Casein in terms of purity and quality. We’re surrounded by toxins and impurities each and every day, so why choose a casein protein powder with even more? NAKED Casein contains nothing but 100 percent micellar casein naturally sourced from US farms, giving you everything you need for superior muscle support without the sugars, carbs, and fats often found in other supplements. If you want to build lean muscle, increase your metabolic weight, and help your body look and feel its very best, get NAKED Casein and take advantage of its bevy of benefits today. Your muscles will thank you in the morning!